Cian O'Connor meets Chinese ambassador Luo Linquan. Image: Credit: Horse Sport Ireland. IRISH OLYMPIAN AILEEN MORRISON will compete in the Japanese leg of the World Triathlon Series in Yokohama early on Saturday. Morrison, who finished fifth in the French Grand Prix a fortnight ago, will be looking to boost her world ranking points with a top 10 finish ahead of the International Triathlon Union Grand Final in Auckland in three weeks’ time. The Derry native, who finished 42nd at London 2012 after an unfortunate crash, has been in fine form for the majority of the season. She is currently ranked 13 in the world and will be competing in Japan against Olymopic Silver Medallist Lisa Norden and number one-ranked Erin Densham. The region has taken a weather-related battering in the past week as a typhoon swept through the area but organisers are hopeful that the event can go ahead without major disruptions. Morrison finished fourth at last year’s triathlon in Yokohama. Olympic show jumper Cian O’Connor is also in action this weekend at the FEI International Show in Beijing. 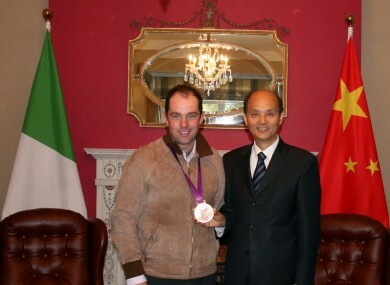 Before he flew out to the Far East, the Bronze Medal winner visited the Chinese Embassy in Dublin and met Ambassador Luo Linquan. Horse Sport Ireland CEO Damian McDonald said: “It is very welcome that Ireland will have an Irish Olympic medallist competing in China. Email “Back to the day job: The challenges keep on coming for Irish Olympians”. Feedback on “Back to the day job: The challenges keep on coming for Irish Olympians”.